all who are thirsty: "Hold On"
“Hold on,” Josh said calmly. I held my breath as the back end of the car slowly slid off the muddy road into the grassy embankment on the side of the road. We had been driving since 8 am and the rain was still coming down. The paved road had been abandoned several hours ago. We had already passed an over turned, over loaded, lorry truck and were feeling a little on edge as we crawled along at 10-20 km/hour. 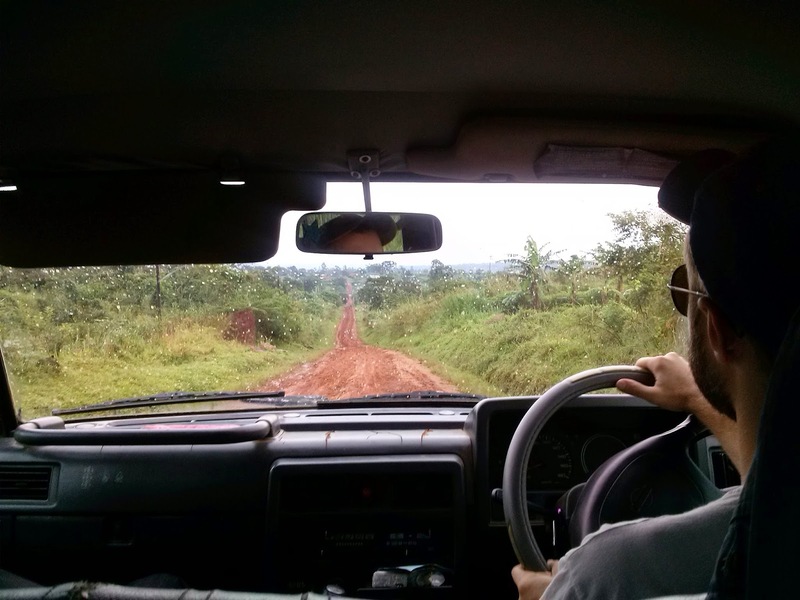 Josh was exhibiting mad mud driving skills as we slipped and slid over the road on the way to Hoima. A week ago we had received a call from our friend Edward, the headmaster at Christ school, that his 97 year old mother had gone home to Jesus. This meant we packed our bags and left the next day to travel to his family’s home town for her burial. This was my second visit to Edward’s homestead. I feel very blessed to have met this amazing lady who loved Jesus and loved her family and community. It was so good to be with Edward, his wife Christine and almost all of their 8 children. I have never been to such a large burial. About 4 large white tents packed with hundreds of people trying to avoid the blazing equatorial sun (yes it finally did make an appearance). Many more loved ones crowded under trees or sat in the sun on matts. Josh gave a speech, along with many others. And Mama Edward was laid to rest. As we gathered around the burial sight I was near the smoking cook fires, with pots the size of kiddie pools full of rice, beans, posho, and beef. All the guests found a place to sit and ate. The family served graciously and we at a delicious meal, probably the best beef palau I have eaten in Uganda. Ugandans have taught me how to morn well. With your whole heart, out loud, with lots of tears, and a whole community around you. Just before dusk we left the family farm and drove back in to the the city center to find a hotel. After driving around in the dark on such well marked roads, we found a place that was clean and comfortable, except for the mountain pillows (pillowcases stuffed to the max with little foam cubes). I opted for no pillow. And we fell into bed. What a day! The next morning Josh and I along with teammates Sarah, Pat, and Kym and 2 Ugandan friends thanked the Lord for the sunshine and hit the road to make the 8+ hour trip home to Bundibugyo. We made great time on the much drier roads. The windows were down and the warm Ugandan breeze blew in as green rushed by. Lunch in Fort Portal meant we could eat at a restaurant that serves western food! We were feeling refreshed and adventurous as we returned to the pavement and headed over the mountains to Bundibugyo on this clear beautiful day. All those dirt roads must have made Josh nostalgic because he decided we should take the old dirt road over the mountains. I mean, clearly we need a little more adventure in our lives. “It’ll be fun” he said, “The views will be amazing” he said, “Sarah has never driven the old road.” He convinced us! And it was beautiful… lush green, jungle vines, waterfalls, towering trees. We rounded a corner and… stop. A fallen tree was in the way. Josh got out to inspect. Someone had cut a few branches away to pass by on foot. If only we had a panga. Then Josh had the grand idea to use his truck to pull the tree out of the way. 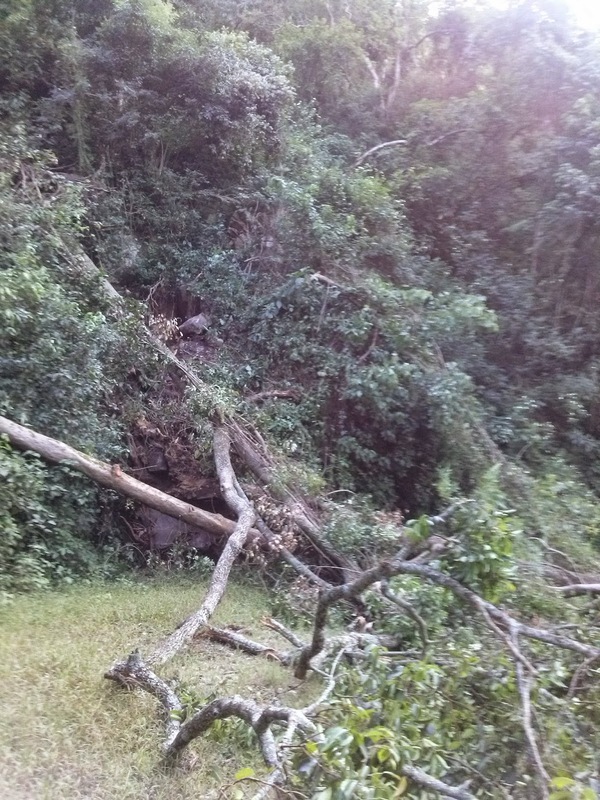 After five large branches were cleared and only a few small boulders tumbling down the embankment, we could pass. We hopped in, rounded the corner and oh man! Stop again. Five trees one of which had a diameter of around 2 feet had slid down the mountain right over the road. If only we had a chainsaw… and a bulldozer. Sarah noted there has to be some metaphor to life here. Just when you are feeling good about the branches you were able to remove by yourself, just when you are feeling like “I got this”…. you round the corner to a tree avalanche. An absolutely immovable, completely impossible for you to do anything about in your own strength, log heap. As we turned around and drove back to the new road. I felt the Spirit kindly speaking, “Yep, there are many more “logs” ahead, but I have plenty of chainsaws.” Through Me you have access to all the power you need for the road to which I have called you. And if you wander on the wrong one, I can turn you back around. I am so thankful for His leading, for the adventure… and for gentle humbling. AND glad to be on the road that would finally taking us back home to Bundibugyo.